What do you call a company that leases its customers equipment that’s so inferior that it’s constantly breaking down and in need of replacement? What do you call a company that reduces the hours of the stores where you get replacements for that cheap equipment? What do you call a company that makes those stores bigger and nicer but also makes them less efficient by requiring employees to walk long distances to retrieve that replacement equipment instead of turning around and grabbing it off a shelf, as they did in the past? What do you call a company that develops such a bad reputation for customer service that it decides to change its name to escape that self-imposed but well-deserved stigma? 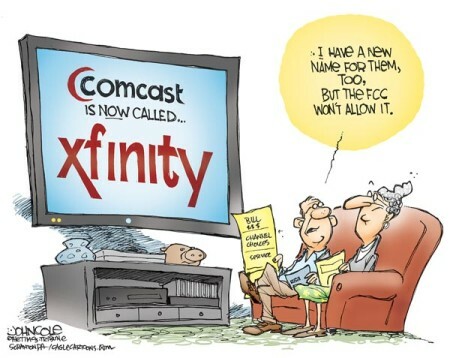 The Curmudgeon doesn’t know what YOU call and he knows what THEY want us to call it but HE calls it Comcast.